Rarely have I witnessed the second half of a film spiral downward so quickly, decisively, and egregiously as Downsizing. The premise is promising: in the not-so-distant figure, Norwegian scientists develop a process called “cellular miniaturization,” in which organic matter can be shrunk to a fraction of its original size; in the case of humans, it’s down to about five inches. The breakthrough is fashioned as a cure for the ills of overpopulation, a 200-to-300-year transition that will end with humankind imposing less strain on finite natural resources. The incentive for people to undergo the irreversible procedure is that because the expanding, but still-isolated downsized communities utilize less space and resources, modest means in the regular world are compounded in the downsized world. The middle class can suddenly find themselves millionaires living lives of luxury in a land where dollhouses are mansions and toy boats become yachts. That’s the lure for Paul Safranek (Matt Damon) and his wife Audrey (Kristen Wiig), who learn that their $150,000 in savings converts to $12.5 million in the downsized world. Paul decides to abandon his Middle America woes and move to a gated microcommunity called Leisure Land Estates. There’s an initial satire of the extremes people will go for the sake of material possessions and upward mobility. 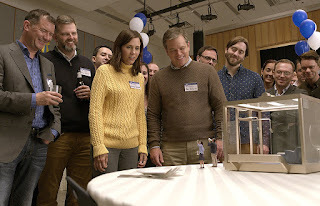 Where Downsizing could, nay, should have headed are the cascading mores of a consequence-free culture, introduced by Paul living downstairs from a wealthy hedonist played by Christoph Waltz. There are hints that the downsizing technology is being wielded as a means of subjugation by various countries and factions, and a better film would have further explored how this oppression intrudes into the supposed utobia of the miniature world. Finally, fiscal reality suggests that as more humans downsize, an economic equilibrium would take root and any financial disparity between the large and small worlds will ultimately diminish, if not disappear. So, in what direction does writer-director Alexander Payne (Sideways; Nebraska) take Downsizing? An ill-defined eco drama, which begins with Jeff meeting Ngoc Lan Tran (Hong Chau), a one-legged Vietnamese dissident exiled to the downsized world, where she works as a cleaning lady. Jeff feels bad because he broke Ngoc Lan’s prosthetic leg, and instead of fixing it or finding a new one, he tags along with Ngoc Lan’s workaday. A lot of aimless earnestness ensues, punctuated by some problematic humor revolving around Ngoc Lan’s broad broken English. Eventually, Jeff and Ngoc Lan take a pilgrimage to Norway, where Payne doesn’t just squander his promising premise, but virtually forgets it. Nothing that occurs over the film’s final third realistically has anything to do with the consequences of miniaturizing. Instead, there’s a lot of really bad dialogue and really bad acting in service of a rudderless storyline. It’s both stunning and depressing to watch it all unravel, for a film with such big ideas become so suddenly small.